20 Aug Filed under F!D Luxe, Sister Allison V. Smith. everywhere! You can’t turn around without spotting another lovely AVS image these days. 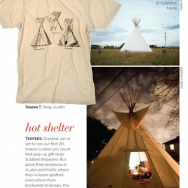 In the current issue of F!D Luxe, you’ll find Allison’s take on teepees and fine art.